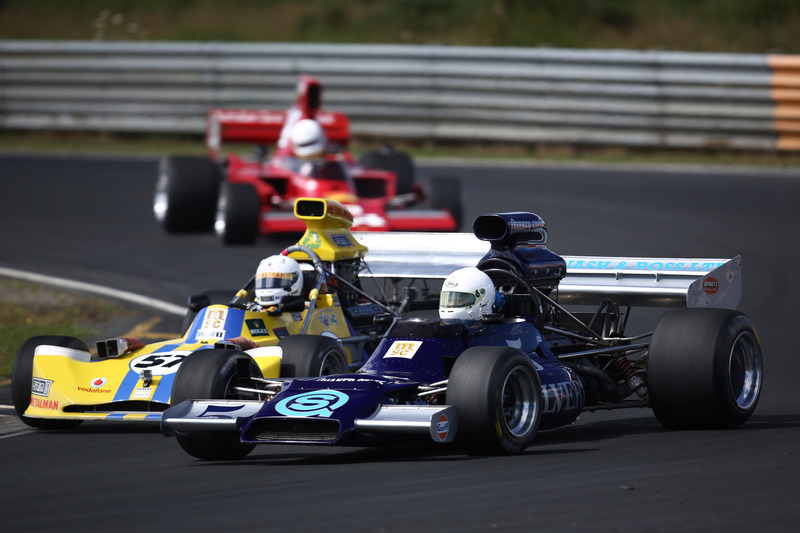 Series super-vet Ken Smith (Lola T332) went on to complete a clean-sweep of the three MSC NZ F5000 Tasman Cup Revival Series races on the programme at the first Gulf Oil Howden Ganley F5000 Festival historic motor racing meeting at Hampton Downs on Sunday, winning both category races very much as he liked. Though track conditions mitigated against him taking a serious tilt at the track lap record, the 73-year-old who lives high in the Bombay Hills less than 20 minutes away from the circuit, maintained the advantage he established on Saturday, winning the first – eight lap – race of the day from Clark Proctor (March 73A/1) and visiting Australian driver Paul Zazryn (Lola T332), then the 15 lap feature in the afternoon from Steve Ross (McRae GM1) and Greg Thornton (Surtees TS8). 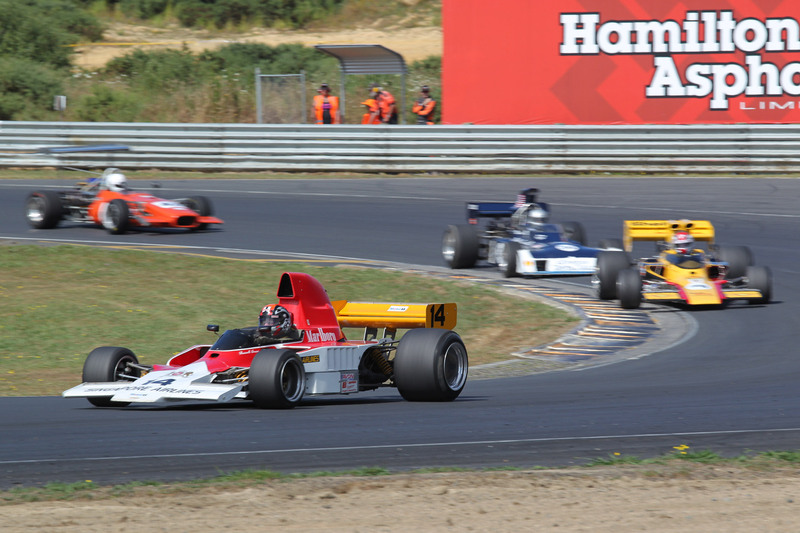 Unfortunately the early action in the combined MSC NZF5000/Invited F1 cars races happened behind Smith with both red flagged and re-started, the first not once but twice. In that race, McRae GM1 driver Peter Burson had a brake issue, his car grinding to a halt on the first lap with the race immediately red-flagged so it could be retrieved. The starting lights had only just gone out after the first re-start, however, when Glenn Richards (Lola T400) clipped Brett Willis (Lola T330) along the short straight between Turns 1 and 2 as a slowing Willis was pulling over with a broken half-shaft. That sent both cars spinning and collected by the following Surtees TS5 of Warwick Mortimer and McLaren M22 of Tim Rush. All four cars sustained damage, two of them heavy, leading to a lengthy delay while they were retrieved and the track cleared of debris. Smith then led away on the second re-start with Proctor and Ross disputing third until Zazryn and defending series champion Andrew Higgins (Lola T400) took advantage of a small mistake by Ross to slot him back to fifth place where he remained to the flag. Alastair Russell was again quick in his McRae GM1 before he was forced out by a broken universal joint. After his brush with the armco on Saturday, Blenheim driver Russell Greer was back in business in his repaired Lola T32 though, using a rear wing and mount borrowed from Steve Ross to good effect to finish ninth between British driver Greg Thornton’s Surtees TS8 and Australian Peter Brennan’s Lola T330. In the feature race later in the day it was Clark Proctor’s turn to bring out the red flag, the high-profile all-rounder with a background in stockcars but better known these days for his efforts in Targa New Zealand and now the MSC F5000 Tasman Cup Revival Series, running off the track at the hairpin with a sticking throttle. Once his cars was out of the gravel trap and back in the pits, the race ran like clockwork however, Smith stroking his La Valise-liveried Lola T332 home at a canter from Steve Ross and Greg Thornton a weekend-best third (despite having to again use his second car, the Surtees, when flywheel issues kept his first, the ex Peter Gethin Chevron B24/28 in the pit garage). Auckland driver David Banks (Talon MR1) also enjoyed a strong run this time, with his own weekend-best fourth, just in front of quick and consistent Aussie Paul Zazryn in fifth. Andrew Higgins was quick early on, only to be forced out by an engine issue. Enjoying a second top 12 finish in both Sunday races, however, was young gun Alan Dunkley (Lola T140), his team having repaired the damage to the universal that put the classic high-wing Class A car out in the first race of the weekend on Saturday. This weekend’s meeting was the first of two at the Hampton Downs circuit over consecutive weekends with the MSC series field gathering back at the circuit next Friday for the fourth round of this season’s series on Saturday and Sunday. Shayne Windelburn (Lola T400) no time.